As the book industry sees a growth in self-published and independently published books (according to Bowker, “self-published titles in 2013 increased to more than 458,564, up 17 percent over 2012 and 437 percent over 2008”), gaining traction – whether it be getting into more libraries and bookstores, receiving more interest by the media, or selling/buying foreign rights and licenses – proves to be harder than ever as the competition grows more fierce. What makes the Frankfurt Book Fair so unique compared to other trade shows is that it provides a unique opportunity for publishers (both big and small) to trade rights face-to-face. Furthermore, it is a gathering place of the largest international professional crowd. Put these two factors together and you see why attending the Frankfurt Book Fair is so important. IBPA understands though, that not everyone has the time and resources to attend, which is why we are happy to support members’ books on their behalf at the Frankfurt Book Fair. 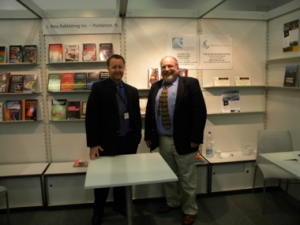 IBPA is pleased to offer members the opportunity to display their books in our Cooperative Booth, or to reserve a booth of their own at the 2016 Frankfurt Book Fair. Members can learn more about these options here. On October 14-18, 2015, the Frankfurt Book Fair brought 140,474 book professionals to Frankfurt, Germany (a 2.3% increase over the 140,291 who were at the event last). A part of that total attendance was IBPA’s Chief Operations Officer, Terry Nathan, and Project Coordinator, Mimi Le. On behalf of IBPA, they crossed the Atlantic Ocean to represent one hundred ninety-two (192) member titles (up from 179 titles represented in 2014). 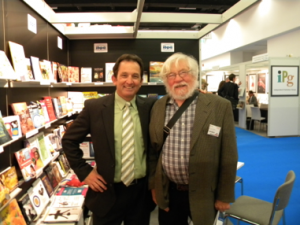 This year marked IBPA’s 30th year at the world’s largest book fair. During the Fair, Terry met with 40 foreign rights buyers and Mimi took 23 walk-in appointments. Each meeting with a foreign rights buyer lasts 15-30 minutes. The first thing to be done is to get a sense of a particular area of interest. Interest areas are generally very narrow. Sometimes we have many titles for them to consider; sometimes just a few. In rare cases, we won’t have anything at all. But, like everything else in this business, it’s a matter of building relationships. A complete catalog of titles represented in IBPA’s cooperative booth is available online and will be sent in a follow-up email to all IBPA’s foreign rights contacts. To take a look at each book displayed, check out the photo album on Facebook. Members displaying in the IBPA booth recently received a report of all of meetings and interest experienced at this year’s show. IBPA’s general counsel, Jonathan Kirsch, has also developed a sample foreign rights licensing contract for IBPA members. The contract is included in our official Membership Benefits Handbook, available upon request. In addition to representing our members’ titles in the cooperative booth, we were equally privileged to have been joined on the show floor by those members who chose to purchase a private booth through IBPA. Special thanks to Ethan Atkin at Cranbury International, Sabine Weeke at Findhorn Press, Brooke O’Donnell, Joe Matthews, and Mark Voigt at Independent Publishers Group, Stephen Buda at J. Ross Publishing, Maria Kjoller at Lerner Publishing Group, Bill Krause at Llewellyn Worldwide, Ltd., Dorothy Smyk at New Harbinger Publications, Jim Schmelzer at Publishers’ Services International, John Atkin at Silvermine International Books, and Valerie Pierce, Dominique Raccah and Sara Hartman-Seeskin at Sourcebooks. By signing up to host their own booth with IBPA, these members received free freight to the Fair in addition to booth support on site. We look forward to hosting them again in 2016! The Frankfurt Book Fair isn’t only known for pulling in the largest professional crowd. This year, like many years before it, consumers were invited to attend the last two days of the fair. The internationally renowned publishing trade fair also offered free admission to refugees and provided guides who spoke their language, in light of the massive arrival of refugees in Germany. According to Frankfurt officials, consumers made up a little less than half of the 275,791 total attendance this year. Walking down the exhibit halls, these “non-trade” visitors were hard to miss. Dressed in their favorite characters from animated films, comics, books, and manga, their presence transformed the book fair into a magical world similar to that of the books that were on display. Do you know who they are dressed as? If you do… let us know! 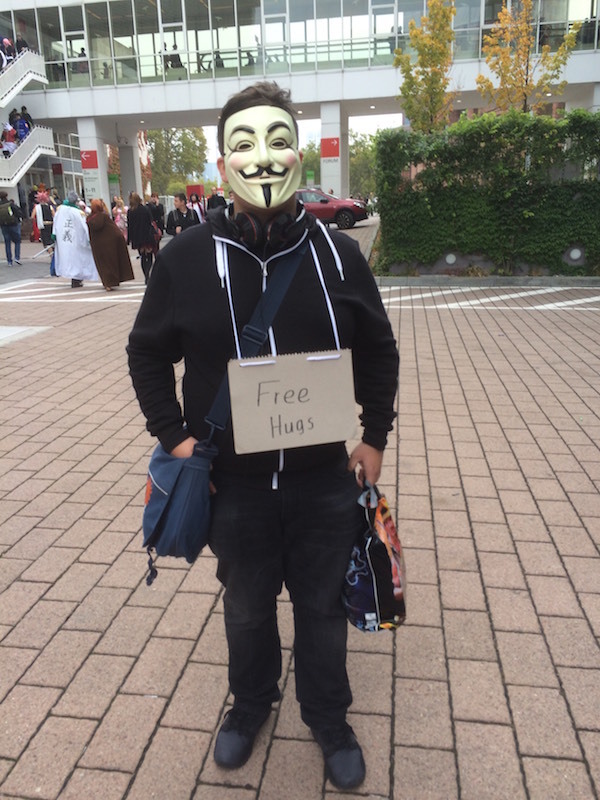 We saw many people wearing a “Free Hugs” sign! There was a lot of speculation going into the Frankfurt Book Fair whether this year’s Fair was going to see a decline in total attendance like the year before. 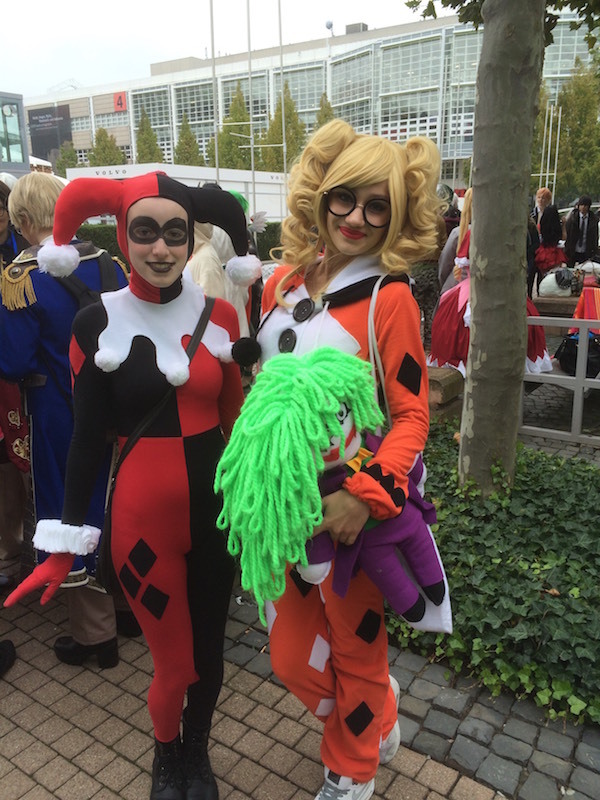 Last year, Frankfurt officials reported that 140,291 trade visitors attended the 2014 fair, down from the 142,921 professional visitors attending the 2013 fair (a decline of less than 2%). With the release of this year’s official show report however, it is clear that the Frankfurt Book Fair is making a comeback and may see a steady increase next year. In Hall 6, where IBPA was located with other English-speaking publishers, similar talks were taking place as we experienced a good amount of traffic through our aisles. Terry was completely booked all four days with pre-arranged appointments while Mimi assisted everyone who stopped by the cooperative booth. We were happy to see a number of folks enter our booth, expressing interest in the titles on display! Next year, the Frankfurt Book Fair will take place Oct. 19 – Oct. 23, 2016. IBPA is happy to announce our attendance at next year’s Fair and look forward to displaying your title in our cooperative booth! More information about IBPA’s Trade Show Exhibit Programs is available here. If you have any questions, feel free to e-mail us at info@ibpa-online.org or call our office at (310) 546-1818.